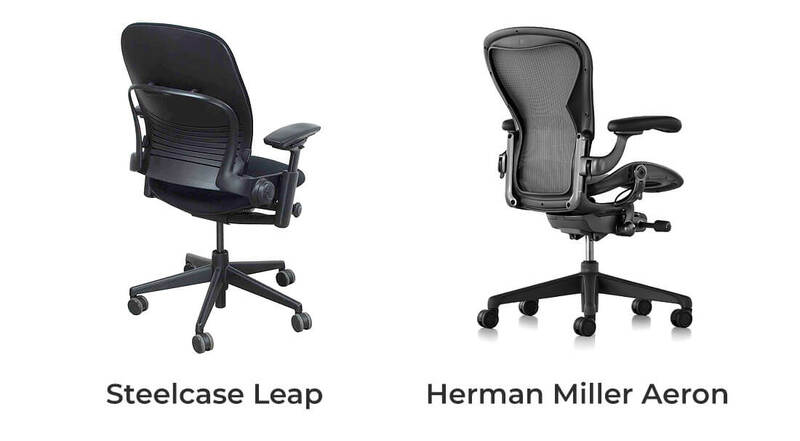 ▷ Herman Miller Aeron vs Steelcase Leap - Who Is The Winner? Herman Miller Aeron vs Steelcase Leap – 4 Main Features Compared! Herman Miller Aeron and Steelcase Leap are one of the best-known and most expensive desk chairs on the market. Many people who are looking for the best ergonomic office chair and have more flexible budget, consider these two models and wonder which one is better: Herman Miller Aeron or Steelcase Leap? Both chairs have few similar features but they also differ in many ways. What’s most noticeable is a different design. So what are the similarities and differences and who should consider buying these chairs? Here is in-depth comparison: Steelcase vs Herman Miller. Steelcase Leap comes in one size with S-shaped backrest which has only one version: You can adjust the lumbar support position, as well as change its firmness. By moving it more up or down you can also make the backrest more curved or flat. Thanks to these features the backrest adjusts to users spine natural curves. In contrast to Leap, Herman Miller Aeron comes in three sizes and customers can choose the type of the backrest: basic one, with adjustable lumbar support or PostureFit which is great for supporting the sacral and lumbar area and helps to maintain proper posture. The basic backrest is of course cheaper, but in this version Aeron is definitely less supportive than Leap. It has only S-shape back, but the lumbar support is not adjustable. The more similar to Steelcase Leap is the Herman Miller Aeron with PostureFit backrest – as it features adjustable lumbar support that moves up & down and forward & backward and you can adjust its thickness as well. This version of backrest is of course the most expensive one. 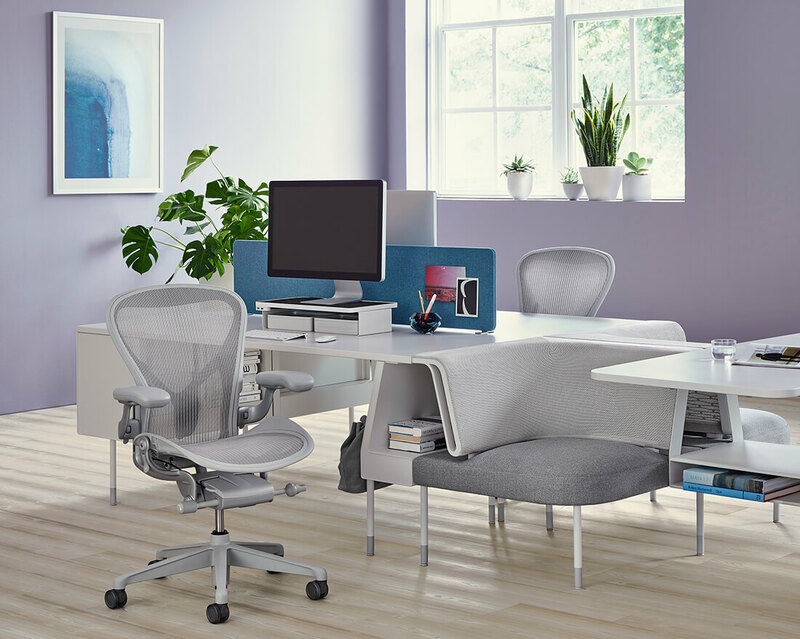 Steelcase Leap and Herman Miller Aeron with PostureFit back offer excellent support for lower back, moreover these chairs are great choice for bad posture. Aeron additionally supports the base of the spine so it is better solution for sacrum or hip pain than Leap. Both chairs are designed to follow the user’s changing positions and mimic its spine movements to support him in every position. Without the additional headrest both Aeron and Leap don’t support user upper back. If you suffer for neck pain you should consider adding the headrest, no matter if you go for Herman Miller or Steelcase chair. Leap has flexible seat edges that allow to reduce the pressure on thighs, especially when you lean forward. Aeron doesn’t have that feature but the seat is covered with suspension material that doesn’t cause pressure on the legs and back which is great for blood flow. Both chairs have adjustable armrest. Aeron arms go up and down, forward and backward and pivot from left to right. Leap arms additionally move inwards and outwards, so they are even better for relieving pressure on shoulders and neck and reducing wrist fatigue. If you’re hesitating Steelcase Leap or Aeron Chair by Herman Miller, you should definitely pay attention to multiple adjustments that both these chairs offer. It will not be a surprise if I say that Leap and Aeron are height-adjustable, so they can accommodate people of different height. Additionally, Herman Miller Aeron comes in 3 sizes for short, average and big people so you can choose the one that will fit your body type perfectly. Steelcase Leap comes in one size, however it has adjustable seat depth to adapt to user height and legs length and reduce the pressure on thighs and knees. Nevertheless, if you really want to be sure the chair suits your height, weight and body type best, you should go for the Aeron. When the chair is properly chosen for the user size, it provides maximum comfort and support. Psst. Do you want something cheaper than Herman Miller Aeron or Steelcase Leap? If so check the best Herman Miller Alternatives. Both chairs have reclining backrest (you can choose how far the backrest tilts) and adjustable tilt tension which allows you to choose how difficult is the back to recline. Aeron Chair by Herman Miller has also 5-degree forward tilt for those who often lean forward when working at the desk. Steelcase Leap doesn’t feature forward tilt however the seat itself glides forward a bit to follow user moves. 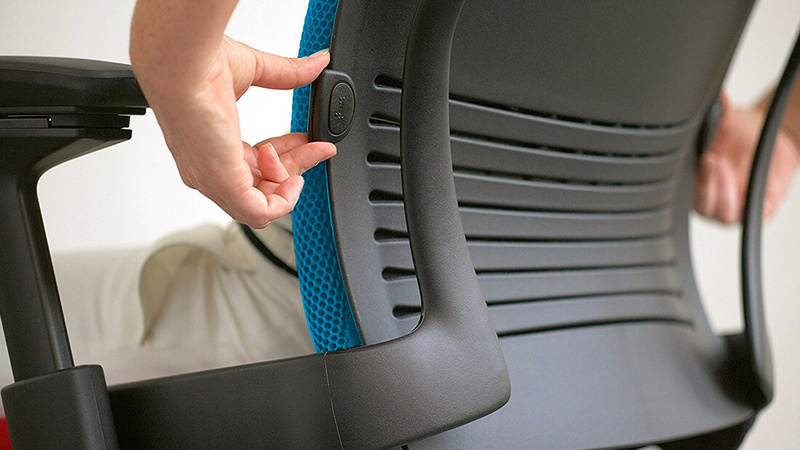 Herman Miller Aeron is covered with woven suspension fabric that provides great air-flow. It’s very useful during hot summer days, as well as for people who have tendency to sweat. However, this fabric may be a bit too cold on winter as it is very breathable. Steelcase Leap is available in few different materials. Fabrics are more airy than leather, however according to some customers not every fabric is comfortable for long hours of sitting. They say the fabric may be a bit scratchy and they recommend paying attention to the type of the material when buying this chair. Steelcase Leap offers much wider range of color versions than Herman Miller Aeron (there are over 30 colors for seat fabric!) so it allows user to choose the one that will suits his workspaces. If the appearance is important for you, Leap will give you wider choice. What is also noteworthy, you can purchase refurbished Steelcase Leap and Herman Miller Aeron in very good condition, with new fabrics – even up to 3 times cheaper. What other people thing about Herman Miller Aeron and Steelcase Leap? 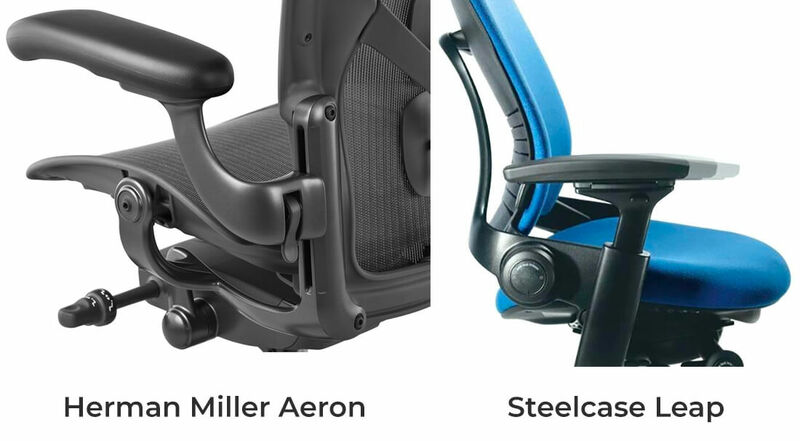 Last time I checked both chairs on Amazon, Aeron had more positive reviews than Leap and higher overall rating. Many people praise Aeron Chair for helping them with lower back pain and hip pain. Thanks to multiple adjustments it provides comfort for those who spend many hours per day at the desk. Some people complain the fabric is “too airy” on winter. Leap is also a great ergonomic office chair for lumbar support. According to customers it help to practice good posture. People love the adjustable backrest that can be more curved or flat, depending on user body type and preferences. I’ve found some complains about the seat cushion – some users say it’s not soft enough and lacks padding. Of course everything depends on individual preferences. Besides, we all have different body type so one chair cannot be good for everyone. Before you decide whether to buy Herman Miller or Steelcase chair make sure to check the features I described above and choose the one that suits your needs better. Both chairs are very expensive but according to dozens of customers, they are worth the money.